We’ve been predicting a spike in donations for weeks. With Christmas now past, old items are replaced with the new gifts. And, if we’re lucky, those gently used “old items” come to your thrift store. It’s critical we don’t miss the chance to say “thank you” to each and every donor. Along with the decorating of the Christmas tree, in the lead up to Christmas, there is a tradition of writing “thank you” notes to friends and family who gave gifts to our family, after the holiday has past. It takes time and effort. It’s an important discipline to recognize the giver of the gift and teach gratitude to our kids. The discipline of saying “thank you” is just as important when receiving gifts from donors to your thrift operation. As a gift giver, the words, “It’s just what I wanted. Thank you!” are music to the ears. That message is delivered immediately upon unwrapping the Christmas gift. Similarly, when a donation is received, the team member should immediately share a verbal message of gratitude. Providing a script or prompts for your team members may help in the delivery of this “thank you” message. Timing is important when showing appreciation. Perhaps even more important is the message delivered after the gift-giving moment has past. A written note demonstrates authentic gratitude that spoken words cannot convey. When the note includes how the gift is used, it attaches even greater meaning to the gift. Likewise, after a donation is received at your thrift store, invest the time and effort in sending a follow up “thank you” note. While handwritten notes are likely unsustainable for every donor, technology allows for personalized messages to large numbers of donors. Start with a just-in-time e-mail that includes a copy of the donor’s receipt. E-mail offers the opportunity to share a quick message with the option for the recipient to click a link for more information. 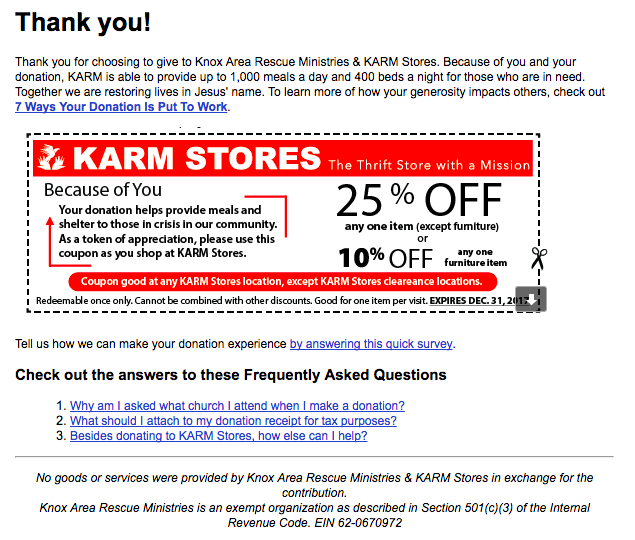 The image at right is an example of a message, customized within ThriftTrac for each organization, automatically delivered once a donation is recorded. Consider a second note, sent the following week, that shares a specific story of how the work of your non-profit is changing lives. 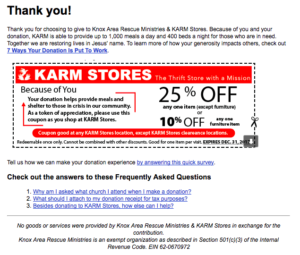 That message helps connect the dots on how a donation to your thrift store is impacting your community. Creating this message and the regular rhythm requires a little work on the front end and some minor maintenance every week but the goodwill is priceless. Expressing gratitude is a dwindling discipline. Intentionally taking the time and effort to share a message of thanksgiving incorporates a donor into the story of you and your non-profit … and a donor for life.